The opposing team took out the star goalie and you’re the only one to fill the position. Click here to play! Hit the ice and block some goals for a chance to win a whole lotta cash. The Rambunctious Rhinos are your team so don the Rhino logo proudly by spinning it across the reels as much as possible. It holds the highest payout of the game, offering up to 10,000 times your line bet if you can spin two or more across an active payline. Don’t forget the equipment! Spin in as many skates, pucks, and goalie masks as possible because not only will these protect you as you skate but they’ll also payout up to 250 times your line bet if you can spin three or more across an active payline. Watch out for the ref’s calls by spinning this game watcher across the reels. Two to five of these symbols will bring in up to 2500 times your line bet. There are plenty of other symbols to lookout for in this game of hockey, including goalies, trophies, tickets, peanuts, and beer. All of these will payout if you can line them up on an active payline. Keep an eye on the opposition by spinning in as many red clad players as possible. This guy is a substitute and will not only replace other symbols to help you win, but will also double all payout when he appears in a winning combo. Take full advantage of penalties as well. The box is a scatter and will multiply your total bet if you can spin two or more anywhere on the board. It will also trigger a number of free spins to help you win this game. 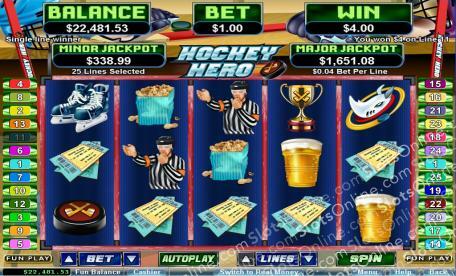 Take to the ice in Hockey Hero and see if you can score some goals for cash! The Penalty Box is a scatter symbol. Spin two or more anywhere on the board to multiply your total bet. Spin three or more to trigger up to 18 free spins. During these free spins, symbols are systematically removed and replaced by clocks. The player in red is a substitute. He will replace all othes, excluding scatters, to create more winning combinations. He will also double all payouts when he appears in a winning combination.